BlackBerry to get Google Apps Support | BlackBerry Blast! 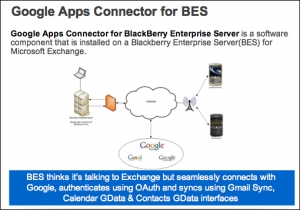 Google has announced the upcoming availability of the Google Apps Connector for BlackBerry Enterprise Server, which allows for proper access to Gmail, Calendar, and Contacts through the default, built-in BlackBerry applications. Google and RIM are currently testing integration between Google Apps and BlackBerry Enterprise Server that will allow administrators to manage users and policies similar to how they work with Microsoft Exchange. Google App Connector for BES is currently in beta and is expected to be released in July.